News Alert: Due to its high fiber content, garbanzo beans are excellent for weight loss diets because they keep you fuller longer and control appetite. Interestingly enough, humans have eaten garbanzo beans for over 10,000 years and they have been cultivated for the last 7,500 years (chickpeas have even been found in archaeological sites in Jericho!). Garbanzo beans, also known as chickpeas, are cheap, tasty and versatile. What more could you ask for in the most consumed legume in the world? How do garbanzo beans support weight loss? Low in calories: 106 calories. High in fiber: 5.5 grams of fiber. The combination of high fiber and protein helps keep us fuller longer. A research article in the Journal of American Dietetics Association (JADA 2008) demonstrated that a regular intake of about 700 grams (or about 4 cups) of chickpeas per week helped decrease cholesterol in subjects with high cholesterol by 16mg/dl as well as helped with glycemic control. 1. Canned. Convenient when you are short on time. Buy in bulk when your favorite grocery store has cans of garbanzo beans on sale. If the can contains added salt, drain and rinse the beans with water in a colander to remove excess salt. Interestingly, garbanzo beans are sold in glass jars in Spain! 2. Dried. Cheap and easy to make! 1. While cleaning up supper dishes, pour one to two cups of dried garbanzo beans in a pot on the stove. Cover beans with cold water. Let sit overnight 12 - 24 hours. 2. The next day, drain off water and rinse the beans in a colander. Then, cover the beans with fresh water so that water is about one to two inches above the height of the beans. A good ratio is one cup of beans to three cups of water. Bring to a boil and then simmer one to two hours on the stove. Because you soaked the beans overnight, the cooking time can generally be decreased by about 30 minutes. Serving Tips: Take a trip around the world! 1. Moroccan Stew: Enjoy this five star Moroccan Spiced Chickpea Stew! 2. Italian Vegetable Soup: Adding garbanzo beans can enhance texture, taste and nutrition! Try this Minestrone di Ceci from the An Italian in My Kitchen website. 3. Indian Curry: Simmer beans in a tomato curry paste and serve over brown rice or try this Vegetable Chickpea Curry Crockpot recipe! 4. Salad: Make a salad of mainly garbanzo beans or add the beans to your lunch lettuce salad to increase fiber and protein and keep you fuller longer. a. Factoid: Hummus, actually the Arabic word for chickpeas, is a thick spread used on pita bread or as a dip with vegetables. Ground garbanzo beans are mixed with lemon juice, sesame seeds or sesame oil (tahini) and garlic. 6. Spanish Cuisine: You may not think of garbanzo beans, when you think of Spanish cuisine; however, as I am learning this year living in Seville, chickpeas are common in many Spanish dishes. 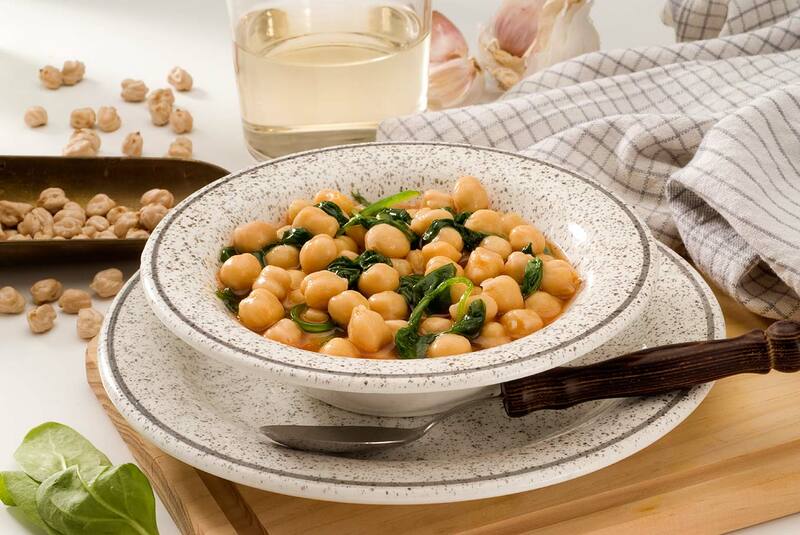 One simple but flavorful dish is spinach and garbanzos called “Espinacas con Garbanzos” that is served as a tapa in many restaurants. Another traditional Spanish dish served in Madrid called Cocido Madrileno is a stew prepared with chickpeas and meat and is served in the winter. Thus, I hope that you welcome garbanzo beans into your kitchen and enjoy some healthy tasty dishes from around the world. Last night, for a Middle Eastern flair, in a frying pan on the stove, I heated some garbanzo beans, freshly chopped parsley, a drizzle of olive oil, feta cheese and chopped walnuts to use as a sauce for pasta. Our family gave it two thumbs up, and our daughters requested it to pack for their lunches the next day. Enjoy losing weight in a healthy manner with garbanzo beans! Martha Henze, MS, RD, Traveling Taste Buds, LLC. Martha teaches tennis, nutrition at a community college and is currently living in Sevilla, Spain for one year and learning to row on the Rio Guadalquivir. Foods & Recipes/"Beans, Peas, & Soy" Nutrients/"Carbs: Fiber, Starch, & Sugar"